Chipps (and Wil) look at one of the most unique and controversial bikes launched last year, the carbon and titanium, lugged, Robot R160. 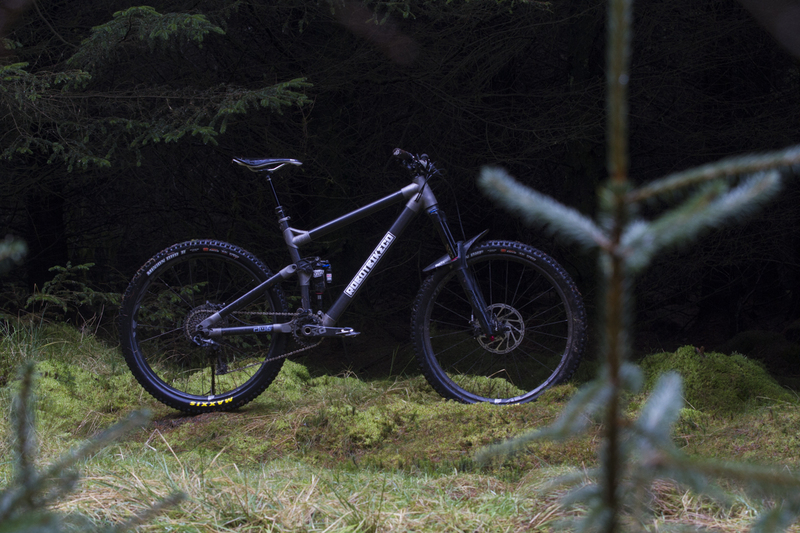 The Robot Bike Company quickly shot to fame at its launch last year at the 2016 Fort William World Cup. While we’d heard rumblings for a while, we weren’t really ready for what was launched: a carbon tubed, titanium lugged, 160mm travel trail and enduro bike. From the future. The designers behind Robot have all known each other for years as, randomly, had I – having ridden mountain bikes with most of them back when they were students at Bath University or, in the case of shiny-headed Ed, the mechanic at the best bike shop in town.) 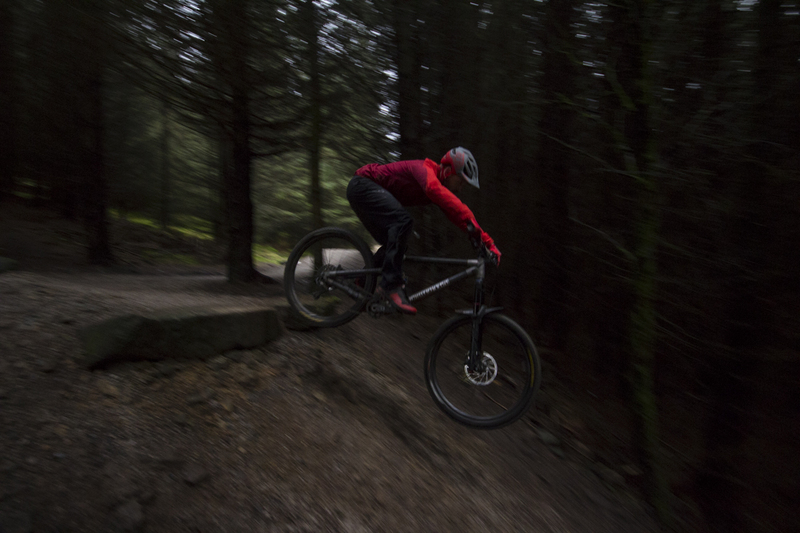 The guys then headed off to a wide range of disparate careers – working in material science jobs in aerospace and Formula1 and, in the case of Ed, as Technical Editor for Dirt Magazine. The Robot R160 may very well be the bicycle equivalent of Arnold Schwarzenegger from the original Terminator. It seemed inevitable, then, that the team would one day find a way to get back together and put their wide range of experience in performance materials and top-end mountain bikes towards a mountain biking goal. The final piece in the puzzle was renowned suspension designer Dave Weagle. He was able to take the limits of the carbon tube and titanium lug design and work within those constraints to produce the DW-6 suspension design. The requirements were unique in that all of the suspension needed to be anchored to the solid, titanium parts of the frame, keeping stress off the carbon tubes which, themselves, couldn’t be curved to fit any sort of design whim. 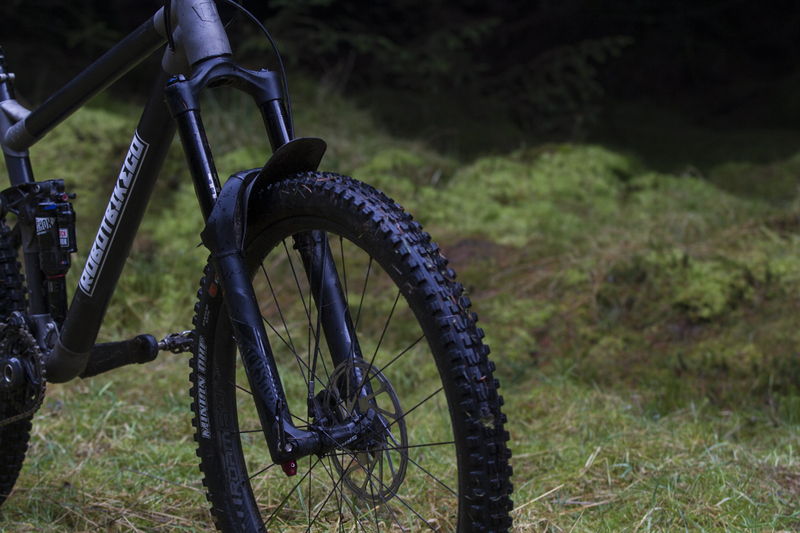 The R160 is Robot Bike Company’s first mountain bike, but it won’t be its last. This actually resulted in a very compact and neat looking suspension design as well as keeping some very clean lines on the bike as a whole. It’s pretty surprising to see that such a compact linkage produces over six inches of squish. With 160mm of travel and 27.5in wheels, the R160 is pitched as a long travel trail bike that’s enduro race ready. Each junction is formed from titanium. Let’s talk about that construction in detail then. The bike is made of titanium lugs and unbutted carbon tubes. So far so complicated, but hardly revolutionary – after all, wasn’t Specialized and Raleigh doing stuff like this in the nineties? Ahh, this is where things get interesting. 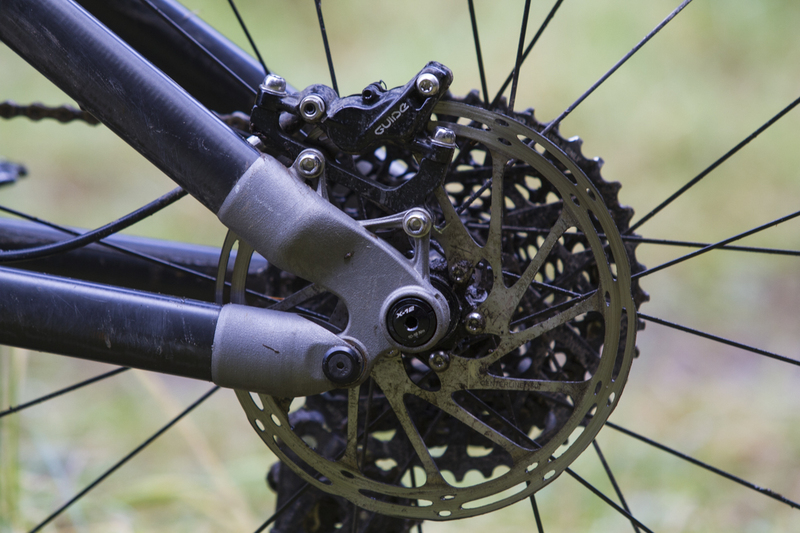 Thanks to some revolutionary processes pioneered for the (actual) aerospace industry, those titanium lugs are individually made for each bike, using ‘Laser Powder Bed Fusion Additive Manufacturing’ – which Robot is keen to point out, definitely isn’t 3D printing. However, if you think of it a little like very, very clever and expensive 3D printing, you might understand how it works a little better. The carbon fibre tubes are strictly round-shaped tubes – no swoopy bubblegum style carbon to be found here. The process starts with a bed of titanium powder, that is laser-fused in a precise manner to create a thin, solid layer where the frame design calls for it. More titanium powder is added and another thin layer is added where the laser melts the metal. This goes on and on, layer after painstaking layer until a plate full of the titanium lugs is complete. They can then be taken off, a little like a giant Tamiya model sprue and they’re ready to be installed onto the carbon tubes. 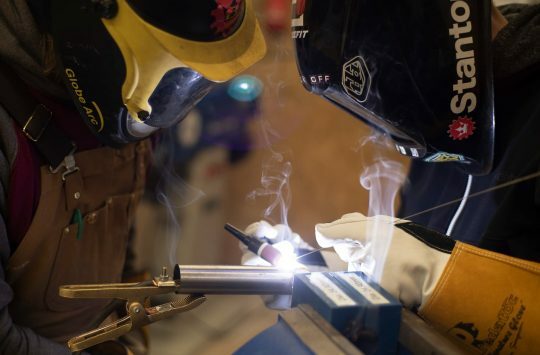 The lugs themselves use a ‘lap joint’ where the inserted tube is supported inside and out to create a much stronger joint after the epoxy glue sets. Oh, and the bikes are all put together in the UK, by mountain bikers if that helps justify the price. Incredibly detailed and complex junctions can be realised with the additive manufacturing technique. With the exception of the threaded BB shell, there are no other threads in the lugs, to stop a stripped thread from ruining an expensive bike frame. 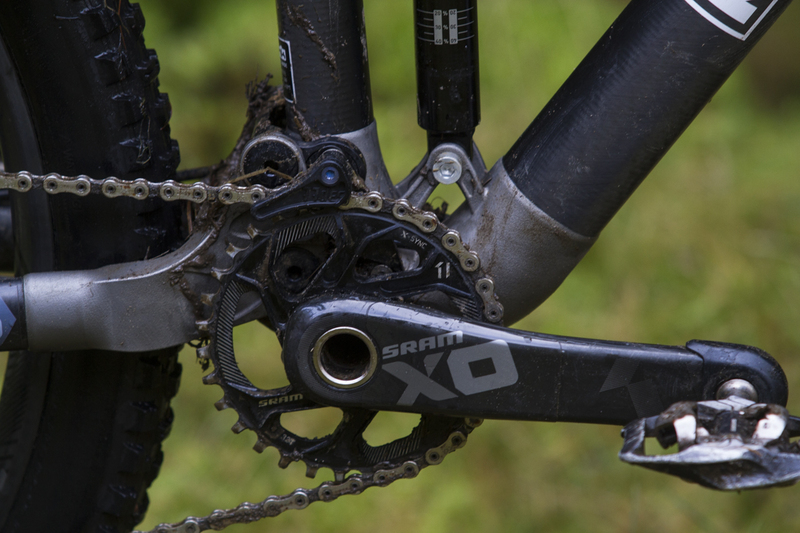 And, yes, it is a very expensive frame – but there are many reasons why. Beautifully formed dropouts with 142x12mm hub spacing. No Boost here. As we’ve said, each set of lugs is individually made for one rider and the carbon tube lengths, too, are trimmed to length to suit the custom geometry for each frame. On Robot’s website, the rider is encouraged to send in a few simple measurements: inside leg, height and ‘wingspan’, and Robot then works out what it reckons is the ideal geometry for that rider. The frame is then ‘printed’ and built to those measurements. Or you could take it another step again and specify your own particular geometry (for an additional fee) if you have an idea for angles or a reach that suits your particular needs. 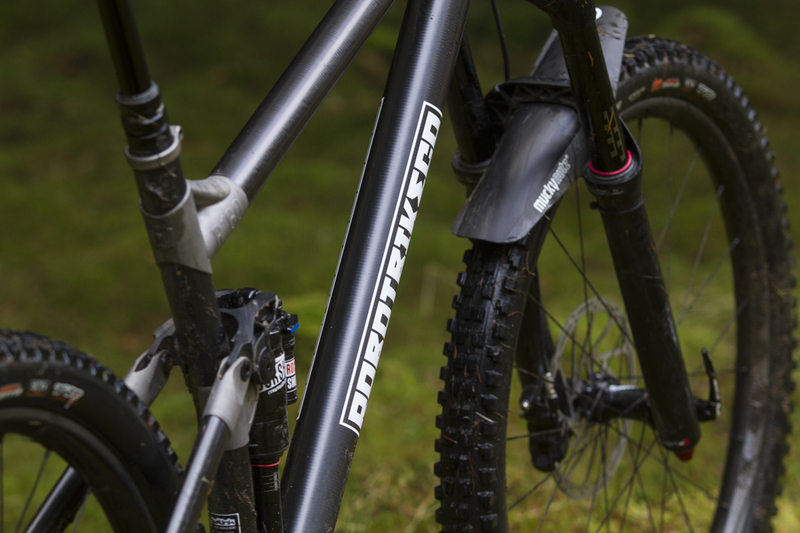 So if you want a 28in top tube and a 61° head angle, you can get it – and there aren’t many places that’ll make you a full suspension bikes like that. 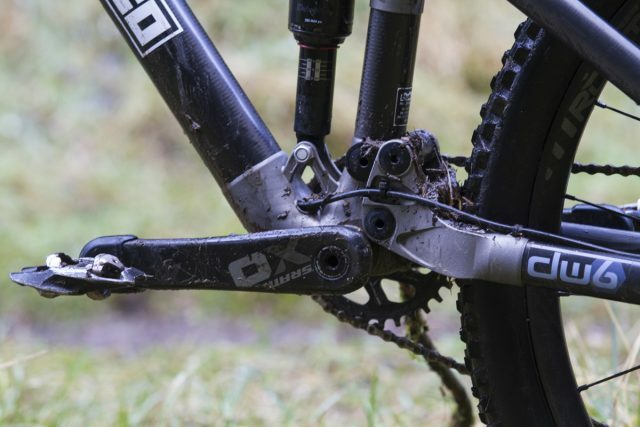 A tidy Syntace X12 thru-axle keeps it clean, and just look at those petite IS brake mounts! 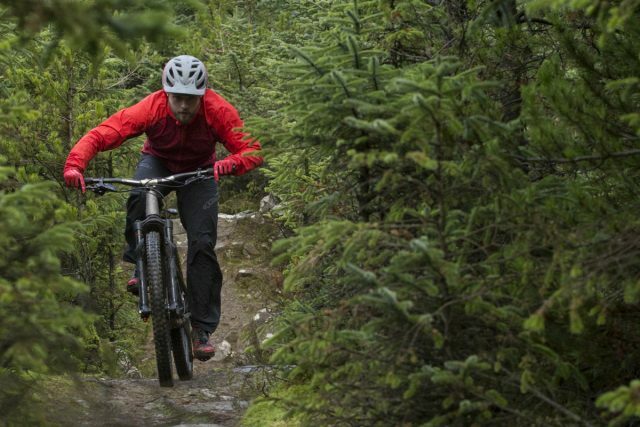 The bike itself is designed around 27.5in wheels and with a relatively conservative approach to things. The dropouts are (currently) 142x12mm and aside from some optional bottle cage bosses, everything is pretty standard sized. 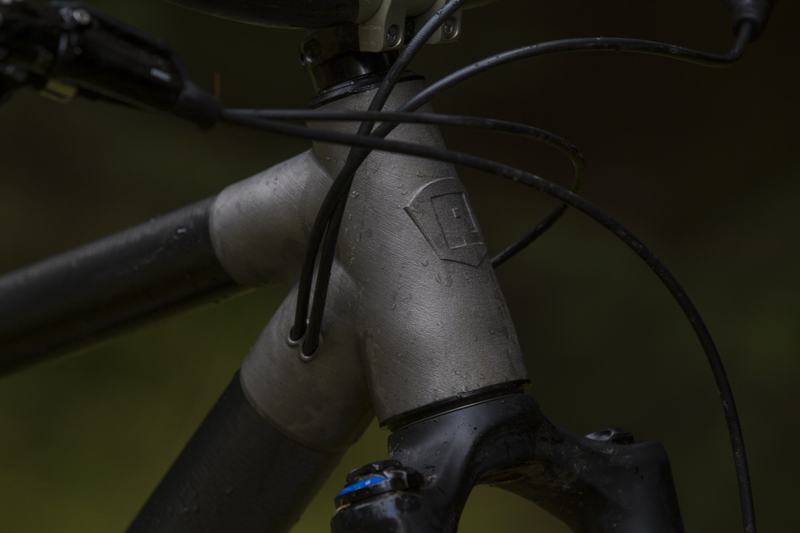 Cable routing is internal – through some very neat, integrated ports and, as we keep going on, the bike has some very clean lines. 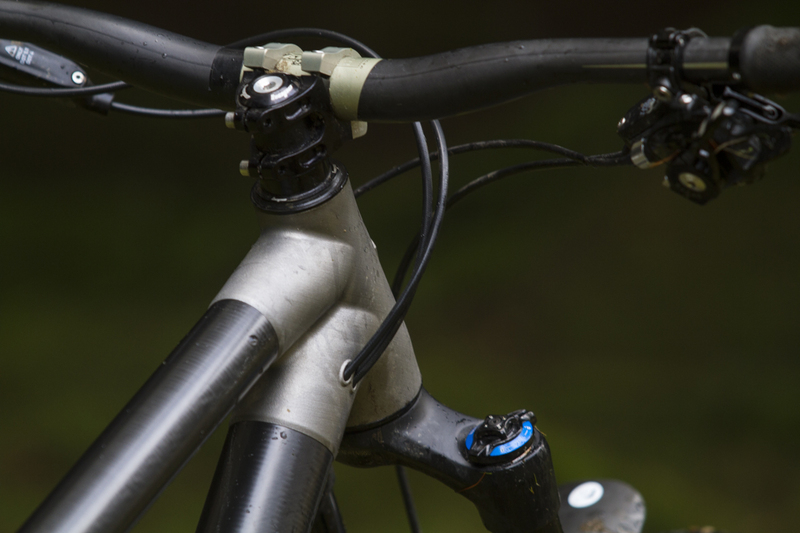 Cable routing runs internally through the front triangle, and externally along the chainstay for the rear disc brake. Looking at those titanium lugs, though, there’s more going on with that suspension linkage than first appears. Behind the bottom bracket shell, what initially appears to be a single pivot actually reveals a tiny additional linkage. 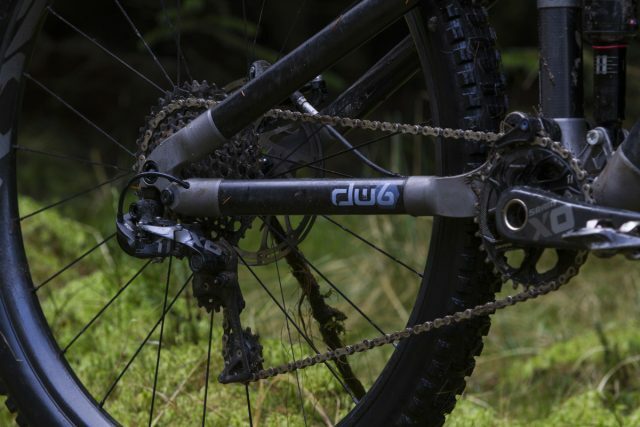 This is the 6th link in the system, making up what Dave Weagle has coined as the ‘DW6’ suspension design. 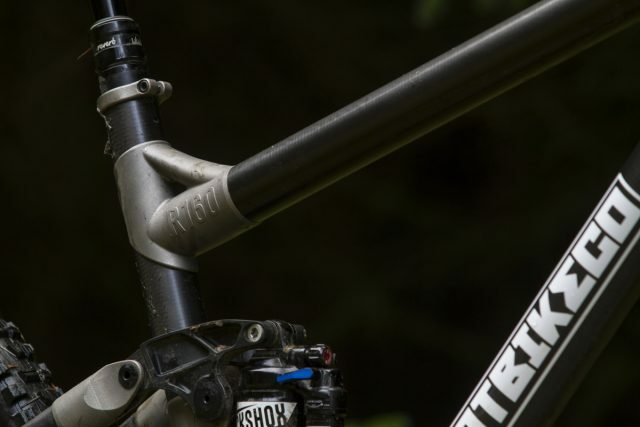 In terms of appearance, it kind of looks like a cross between a four-bar design with a Horst link on the chainstay, and a regular dw_link design. The Robot R160 is the first bike in the world to use the DW6 suspension design. And there’s a very good reason. 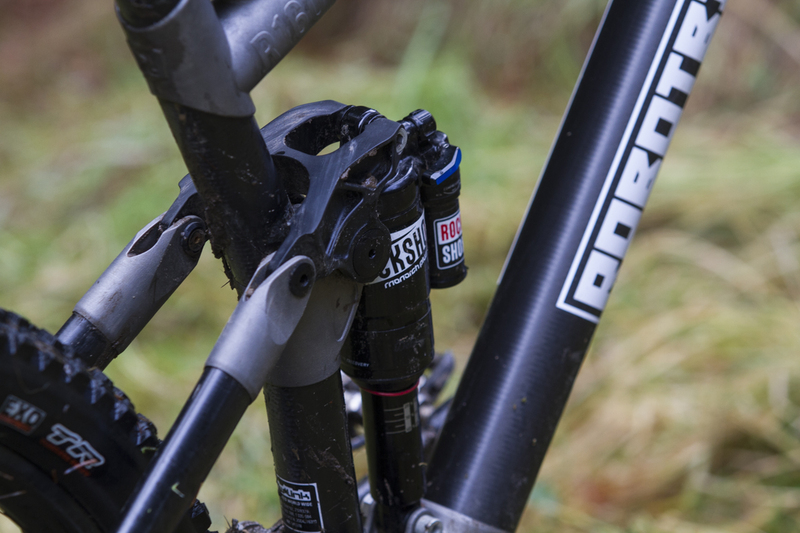 In essence, DW6 is designed to operate within the same design parameters of the existing DW5 design (the platform used on bikes such as the Ibis Mojo HD3 and the Pivot Mach 6), so it features similar chain growth and anti-squat characteristics to keep the suspension firm under pedalling, whilst remaining fluid and open when the bumps attack. Performance wise, the DW6 platform shares a lot in common with the existing DW5 design. The reason for the extra link simply boils down to the R160’s customised frame construction. 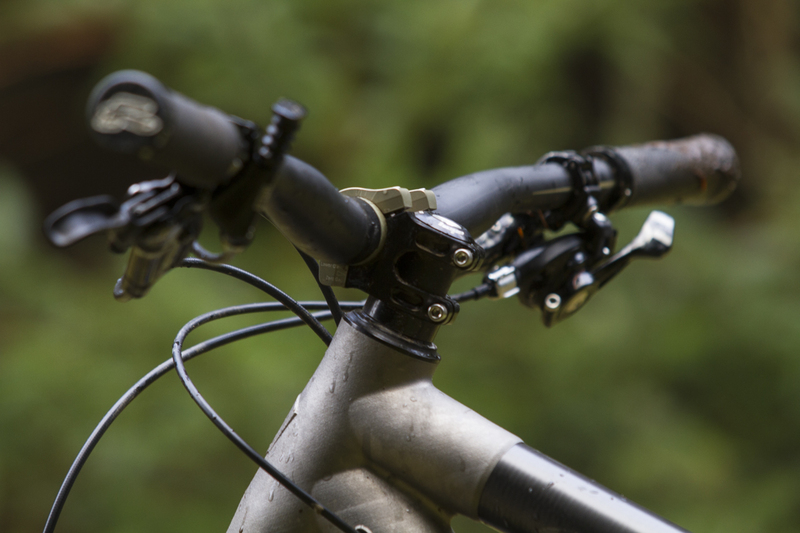 To accommodate geometry changes to things like the seat angle, chainstay length and bottom bracket height that are tailored to each customer, the DW6 platform features in-built flexibility throughout each of its pivot points, so as to keep the suspension feel the same regardless of what the rest of the frame ends up looking like. Despite the high-tech construction, the R160 strikes a very ‘normal’ look front to back. With no less than 12 bearings to be found in the back end of the R160 though, it’s a complex design. Indeed when Dave Weagle presented the design to Ed of Robot Bike Co, it was met with a good dose of British scepticism. But here’s the thing – because Robot is able to create those titanium lugs to such fine tolerances (8 microns to be exact), everything lines up so well that Robot is confident in both the longevity and serviceability of the design. And confident they are – the R160 is backed up with a lifetime warranty for the original owner to cover you for basically everything outside of crash damage. And that’s quite rare to find with high-end carbon mountain bikes. The 160mm travel RockShox Lyrik is an excellent choice for the front of the R160, and worked in harmony with the supple Monarch Plus rear shock. The Robot definitely has a love it or hate it look and we mostly loved it. I was initially a bit reluctant to borrow the bike, as we did, in the middle of the winter, reasoning that 160mm enduro machines are best off going flat out on hot days into dusty corners. 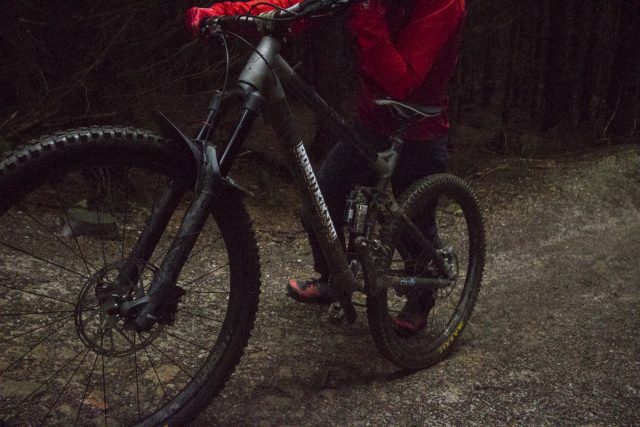 However, for all its travel, the Robot was surprisingly easy to live with, whether going for a quick after-hours blast in the dark, or heading out over the moors on an all dayer of steep ups and steep downs. With a 65.5° head angle and that chunky Lyrik up front, the R160 is begging to be dropped down the steepest lines you can find. Each R160 is custom built according to the rider’s dimensions. Our test bike just happened to be almost identical to what the calculator spat out. These were numbers that we deliberately avoided looking at throughout the test period. After initially being told by Robot that it was “sort of a Medium/Large size”, we simply jumped aboard and got riding, without any preconceived ideas clouding our judgement. 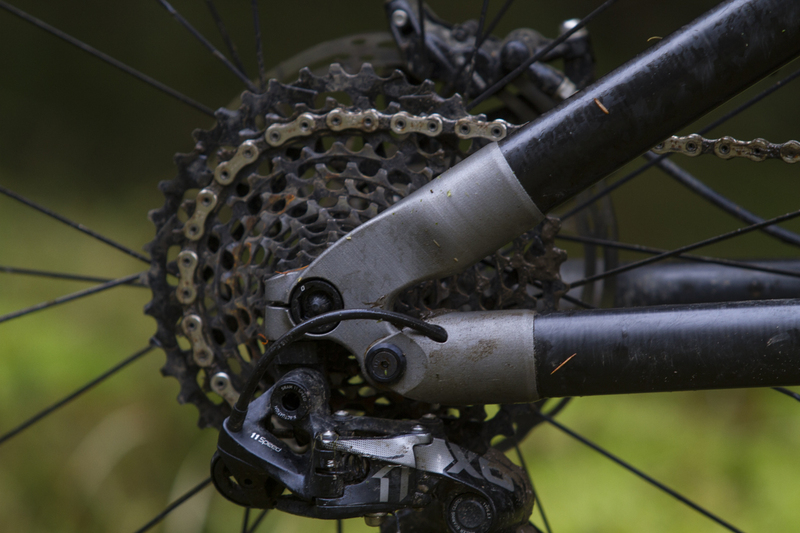 At the end of the test period, we decided to give Robot’s online bike fit calculator a go. For Wil’s 175cm height, the calculator spat out almost identical numbers to the bike we rode. As such, it fit like an absolute glove. The R160 chassis is hugely stiff where it counts, making it snappy and responsive. 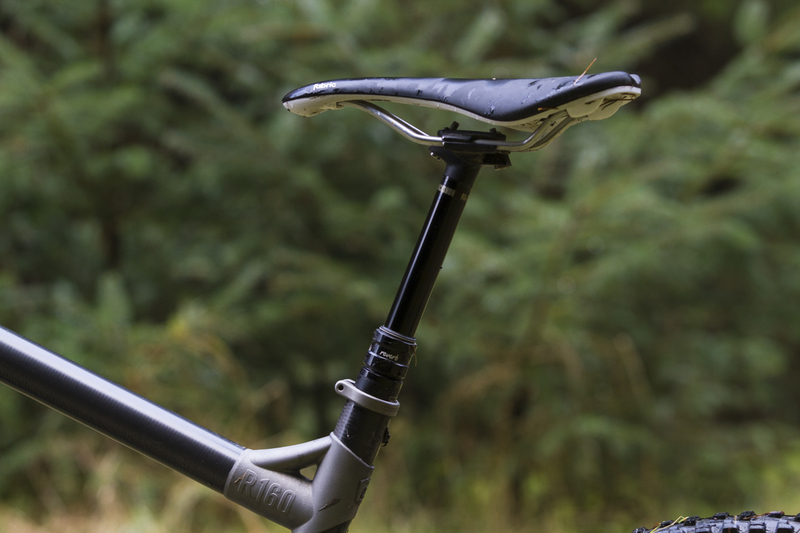 The frame feels tight and responsive, with no hint of flex or creaking and there’s something else. 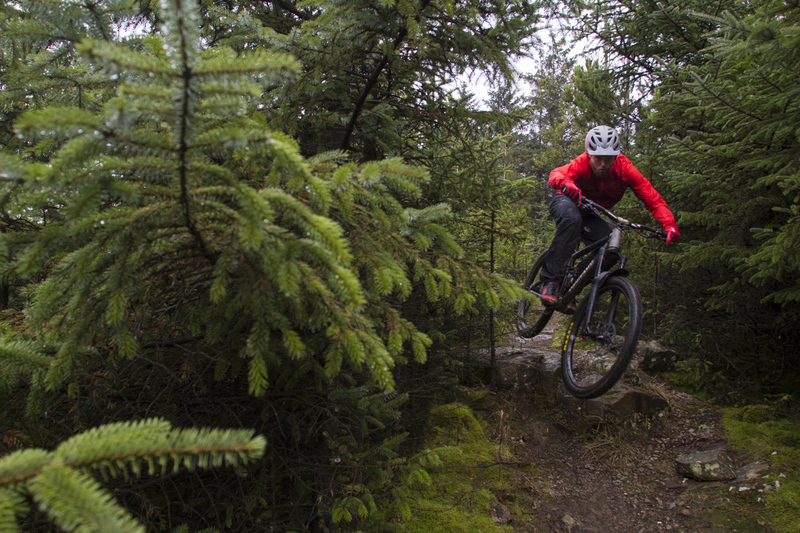 There’s a positive surge of speed when you pedal. This is particularly dramatic when climbing uphill, sprinting to catch (or beat) your mates, or for those aggressive on-trail moves. The suspension has a very positive anti-squat feeling. There are even occasions when this feels at odds with the slacked out front end and it feels more akin to being on a climb-hungry race bike. Get on the gas, and the DW6 platform ignites the R160. 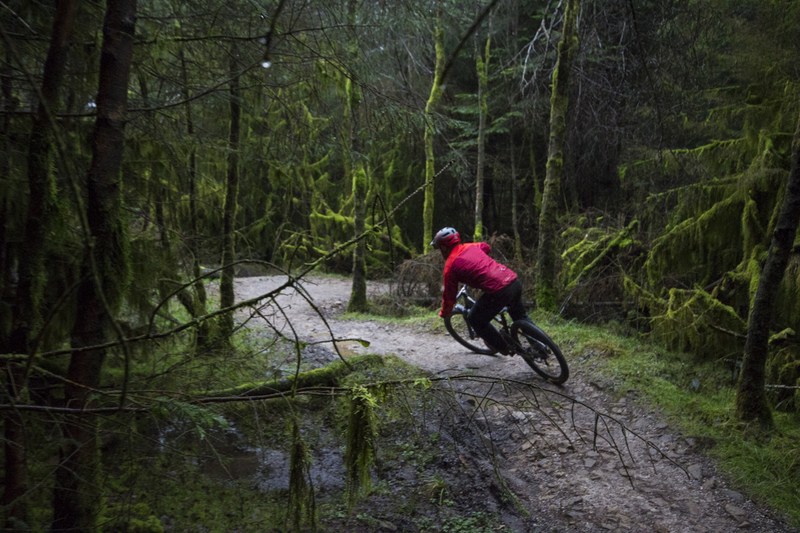 Obviously, the downhills and sidehills are where people are going to want to see the bike shine and it doesn’t disappoint. 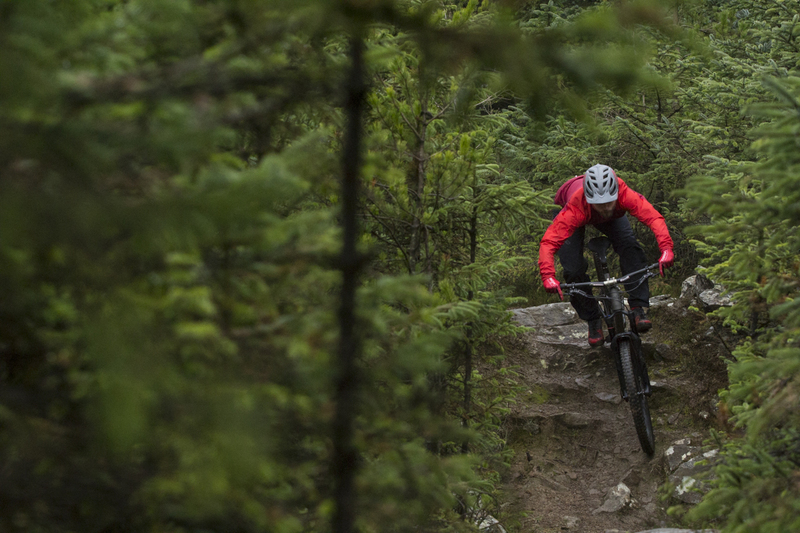 There are no surprises, just a great, stable feel on descents, no matter how steep. 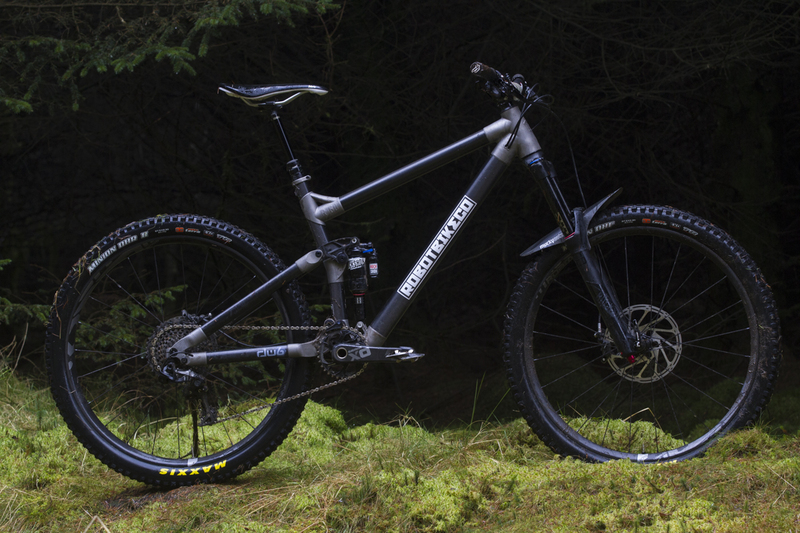 Thanks to the in-built pedal efficiency of the DW6 platform, the RockShox Monarch Plus shock has been specced with a light compression tune. Bolstered by a high volume DebonAir can, it offers an incredibly sensitive action that helps to erase the smallest of roots and rocks. Combined with the stupid-plush 160mm stroke from the Lyrik fork up front, the R160 floats through downhill rock gardens like they don’t exist, both tyres remaining glued to the terrain while your bodymass follows a much smoother path down the trail. 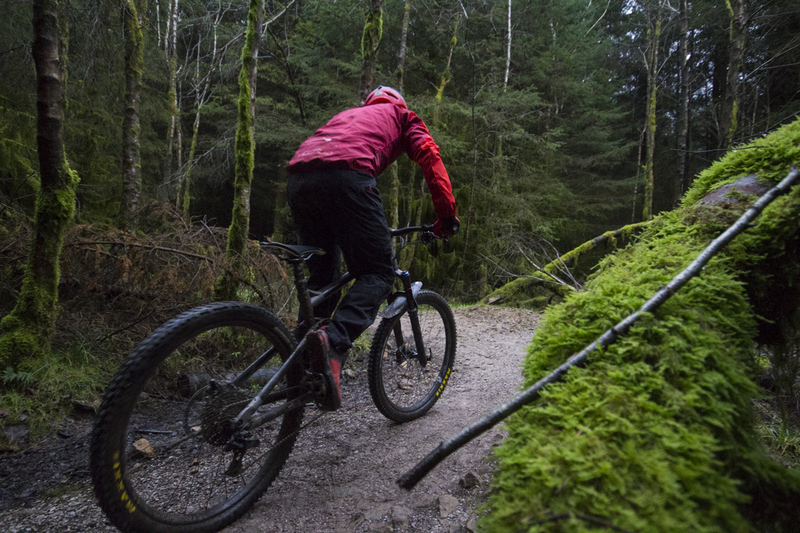 The RockShox suspension package and DW6 platform creates a terrain-hugging monster when things get steep, fast and rough. 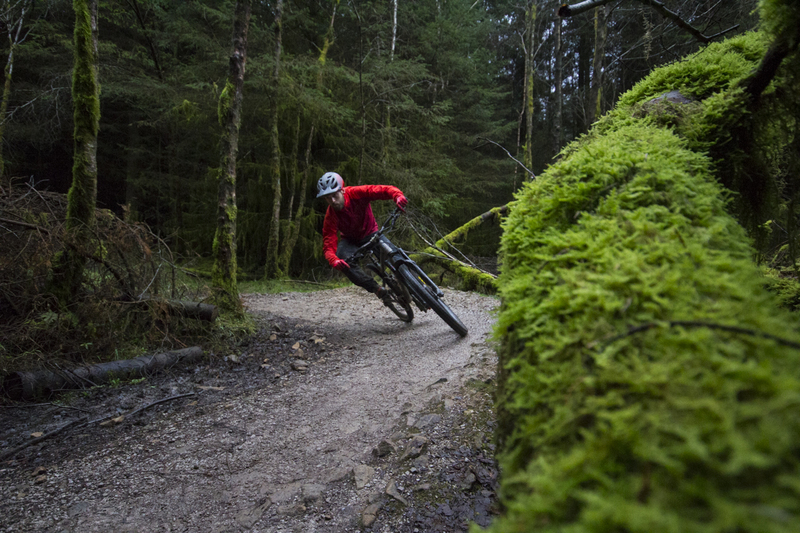 The anti-squat helps with wheelie drops and power moves over rocks and roots and the geometry on the bike we have seems ideal for a life in the steep woods. But the magic in the Robot R160 is that you can tackle this sort of terrain without having to own a set of skills normally reserved for World Cup level athletes. It has an ease of use feel to it that means riders of varying skill levels will be able to climb aboard and have a very, very good time. 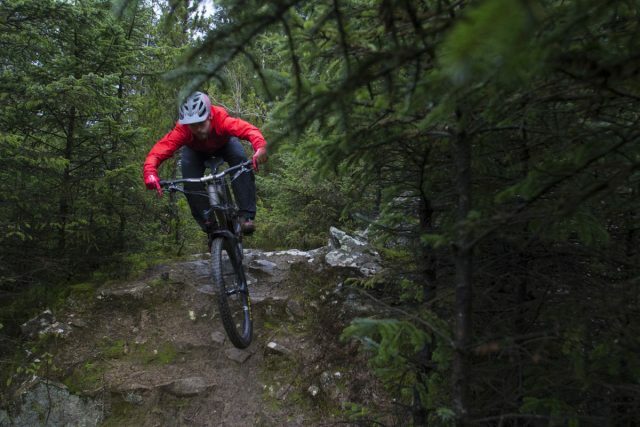 You don’t have to be travelling at warp speed to unlock the bike or the suspension’s potential, and it seems just as content joining the dots on a steep, slow-speed technical trails as it is leaving it wide open on much faster alpine descents. This is a bike that delivers confidence by the bucketload. Over the course of the wet and wild weather of the test, it seemed that the bike fared very well. There was no play in the frame bearings (those on the SRAM wheels were another matter) and the bike looked as good after the test as when we first picked it up. We’ve heard that Robot has made several changes since this early bike – all bearings and fasteners have been upgraded to the highest quality of corrosion resistance and the rather fiddly looking lugs behind the bottom bracket, which encouraged us to play the hose on it to clear it of mud, have now been tidied up to discourage the mud to collect in the first place. Yet despite its descending chops, the R160 is equally at home powering along less demanding terrain. It’s super versatile. Since Robot built this particular bike, the geometry has also been tweaked ever so slightly. We’re told the seat angle has been steepened a degree to 74°, and the seat tube itself has been shortened a touch to increase compatibility with longer stroke dropper posts. Of course you can still custom spec your R160 to your heart’s content. But based on our experience, we’d highly recommend that you trust Robot – they know what’s up. Newer R160 frames will features a shorter seat tube length to open up compatibility with longer stroke dropper posts. 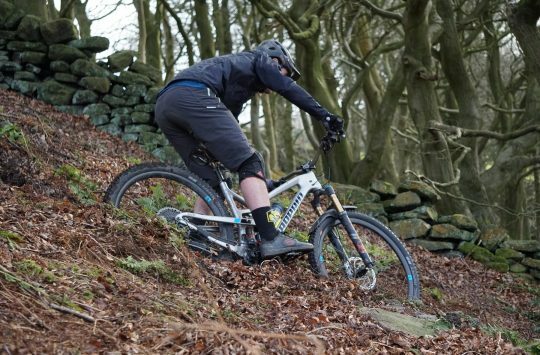 Yes, it’s a heftily priced machine and we suspect that half of those that Robot sells will be bought by well-off mountain bike lovers who’ll admire the workmanship, but never reach the bike’s potential on the trail. The other half, though, will get a tough life and we reckon that those bikes will definitely rise to the challenge. Robot has designed the R160 for use with proper bars and a compact stem. Oh, and the Renthal cockpit is dead lovely. 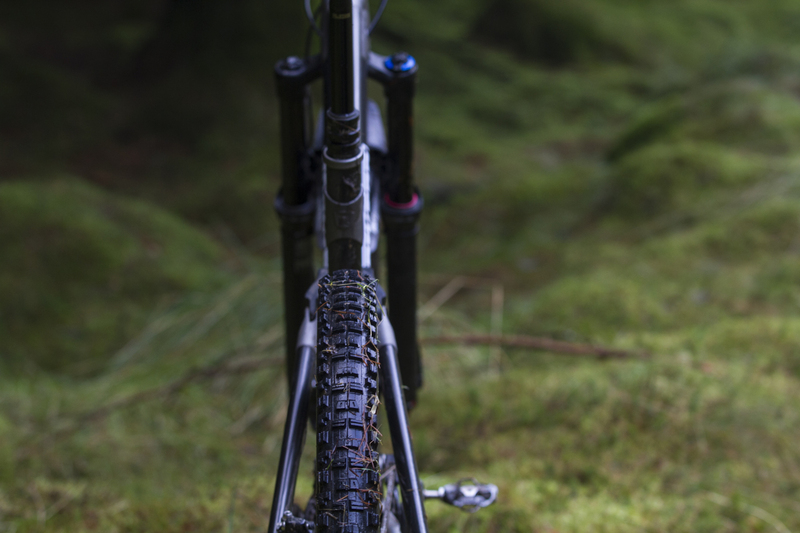 You might feel bad about getting such an expensive bike properly dirty. But it’s a frame that’s built with durability and strength in mind. Plus, it comes with a lifetime warranty. 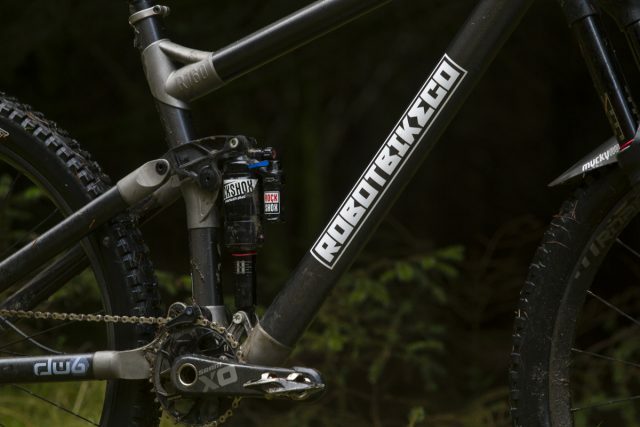 The Robot is a bike that will only appeal to a small slice of the mountain biking pie. 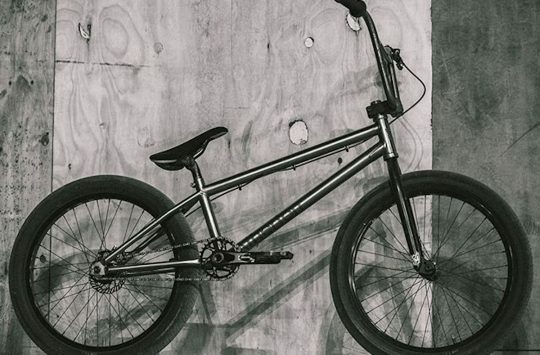 You might have your own ideas about geometry, you might have a need for custom sizing on a premium quality bike and you definitely want to be the only one on your street with one. Oh and you have to be able to afford it – or at least to justify it to the credit card. If that’s the case, though, you need to think about living with a Robot. I’m glad this exists, and that it’s good. But that’s a loooong way beyond any remotely justifiable budget for me. It’s almost surreal. Where are the shots from?